One of the key ways we get ideas for new skiboards is by riding short skis that have the same basic design geometry that a skiboard does. Specifically, center mounted bindings, symmetric flex front to rear, little or no width taper from tip to tail and a short turn radius. These are typically marketed as short twin tip skis. They have quite a different ride than the traditional front side ski. The best of these short twin tips are often thin top-to-bottom with soft flex and were originally intended for smaller riders, so the challenge in setting them up for heavier riders is mounting bindings with adequate strength. We have found that the best binding mounting system is one that we've developed using the Tyrolia rail system. For customers that own multiple skis and want the quick interchangeability of track bindings, we've been experimenting on-slope for the last few years with a binding mounting setup that uses two thin aluminum plates (Dyna-Plates), each held to the top of the board with a single threaded insert. The best bindings for this setup are the rail bindings sold by Tyrolia such as the SLR and Power Rail series since they mount in a single position on the board and are easily adjustable without tools for boots of all sizes. This setup has allowed us to test a range of short twin tips as well as our own Spruce boards using our eastern Pro Staff riders. What we've found is that this rig works perfectly for thin boards that can't otherwise accept full length binding screws and has plenty of strength for riders of any weight and ability. As a result of our successful testing of a number of short twin tips, we offer two skis with rail mounted binding systems. This is a ski that measures 131cm in length. That sounds long to most skiboarders, but both the tip and tail are high and long, so the running length is only 95cm, which is shorter than the Spruce 120. The “Jr.” in the name is really just about the length since the construction is the same as the longer “Adult” models except for the base graphics (screenprint vs die cut). Vertical wood core with sidewall construction and an elastomer dampening layer that gives an amazingly quiet ride. There is rocker at the tip and tail and turn initiation is dead easy. This ski is very smooth in all snow conditions and the full length of the edge stays engaged and stable all through the turn, even on ice. With the low-height SLR track bindings mounted it is very quick edge to edge. During the 2015.16 season we tried out the Head Ethan Too in a 141cm length. We really liked this board as a high speed cruiser on packed snow and ice, so we sent a few to some of our long-time customers for evaluation and there was a unanimous thumbs up response. 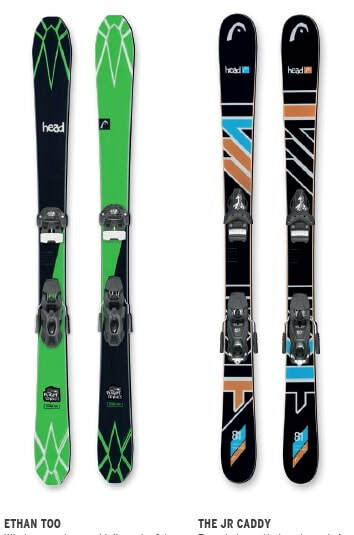 We offer these skis complete with Dyna-Plates and SLR 10 track bindings. As of 2018 HEAD has discontinued the "Flight Series" boards including the Ethan Too.